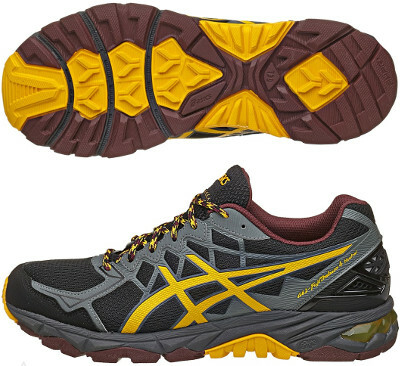 Asics Gel Fuji Trabuco 4 are stability trail running shoes. The Asics Gel Fuji Trabuco 4 features the versatility and great ride comfort which identifies the popular saga among trail running shoes. Key elements are plush cushioning (GEL® available in both rearfoot and forefoot) and good protection (including rock plate) combined with enhanced heel counter for improved support. Upper has been redesigned in current version from its predecessor the Gel Fuji Trabuco 3 making it lighter and with more breathability for a comfortable fit. It keeps the MONO-SOCK® system introduced in previous version with sock-like fit which replaces the traditional tongue preventing pebbles going inside toe box. Base model includes specific pronation control technology (dual density midsole Dynamic DuoMax®) but there is an edition for neutral runners as well. Both are also available with GORE-TEX® upper designed to protect the foot during extreme weather conditions.